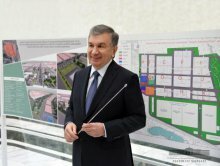 On January 24, the President of the Republic of Uzbekistan Shavkat Mirziyoyev got acquainted with investment projects that are scheduled to be implemented in the city of Tashkent in 2019. The Head of the state at the extraordinary session of Tashkent City Kengash of people’s deputies held on December 21, 2018 noted the need for attracting representatives of large businesses and potential investors to the capital, creating the most favorable investment climate in the city. In this regard, on January 4 this year, the Cabinet of Ministers of the Republic of Uzbekistan adopted a resolution “On additional measures for attracting foreign direct investment in infrastructure development of the city of Tashkent”. In accordance with it, it is planned to attract 2.7 billion USD of foreign direct investment in the economy of Tashkent and implement 273 projects in 2019. At the presentation of projects, the areas and places of their implementation, terms of funds application were analyzed. Thus, it is planned to implement 115 projects in the metallurgical, textile, food, construction, pharmaceutical, petrochemical and other industries, 103 projects in the service sector and 55 projects in housing construction. This will serve to create about 37 thousand new jobs and improve the living conditions of the population. The President paid special attention to the economic efficiency and social significance of projects. He gave instructions on assistance to foreign investors, control over the implementation of projects on time. The economy does not move forward without investment. If we create a proper environment, infrastructure for investors, there will be jobs, production will expand, and tax revenues will increase. It is necessary to encourage enterprises to invest in their development, said Shavkat Mirziyoyev. At a video conference meeting held on January 8, the Head of the state instructed to stop the practice of postponing the use of the bulk of investments in the last months of the year and bring the development figures in all industries and regions to at least 35 percent in the first half of the year and 70 percent in the first nine months. In accordance with this, 70 percent of investments in the current year in the city of Tashkent are planned to be used in the first and third quarters. Stages and terms of implementation, responsible persons are defined for each project. During the presentation, reports were heard on the mechanism for monitoring and taking control over the implementation of investment projects. Thus, a working group led by the Prosecutor’s Office of the city of Tashkent was established in each district of the capital. Measures, taken at all stages from the allocation of land for investors to putting the object into operation, are specified. This will ensure transparency, honesty, eliminate corruption in the process of registration and implementation of projects. Shavkat Mirziyoyev noted the need for supporting projects, promptly resolving issues that may arise during their implementation, assisting the effective functioning of enterprises after they are put into operation. Another news for Tashkent economy is that it is planned to create a modern industrial technopark in Sergeli district with an area of more than 100 hectares based on European standards. It will be convenient for investors because all buildings and structures will be turnkey ready and have all necessary infrastructure. Currently, work has begun on designing the technopark, entrepreneurs have been allocated 85 percent of the area. Here it is planned to create more than 10 thousand jobs. Responsible persons were instructed to speed up the launch of the technopark and promote the development of production of high value-added products. Attention was also paid to issues of improving the quality of public services, modernization of engineering and communication networks in Tashkent. In particular, information was presented on the project of transferring apartment building management to professional management companies as an experiment in Yunusabad district. There are 1,212 multi-storey buildings in the district. It is planned that their service will be transferred to professional management companies. The goal is to improve the financial condition of the housing maintenance system, resolve the issue of problem loans, strengthen the material and technical base. As a result, work with public appeals will improve, and a 24-hour emergency dispatch service will be organized. The President noted that condition of apartment buildings, the wellbeing of their residents depend on this system, gave instructions on introducing this experience in other districts of the city, improving personnel training for the sphere. Relevant instructions were also given on projects for construction of modern houses, hotels, education and medical institutions, other facilities in Tashkent, development of the heat supply system, organization of the Utilities Management Center.